Newark, Delaware (February 19, 2019) – PierVantage, the only true cloud-based business management system built specifically for the marine industry is announcing the rollout of a major upgrade to the platform with over 50 enhancements to functionality. This release has been several months in the making with extensive development, testing and piloting with select partners before the general release to all customers. The enhancements delivered in this major release were prioritized based on customer feedback and by working closely with a small group of their boatyard and boat building customers. For example, the process of requesting parts for jobs and purchasing/receiving those items has been streamlined, and the Pay Bill feature can now be utilized to quickly record expenses and payments via Check, EFT or Credit Card. In addition, with expanded reporting options and improved ability to document granular details, PierVantage continues to build upon its robust record keeping capabilities that their customers already count on. “We are excited to deliver this major release,” said Mike Frayler, head of new product development for PierVantage. “Our team has been working on the new functionality for several months and it is great to provide new capabilities to our customers who have been looking forward to these features. It is a challenge to deliver capabilities that can be configured to meet the needs of all our customers, since every customer does things a little differently than their competitors. The enhancements delivered in this latest release will really help our customers save time, be more efficient, and improve their business,” said Frayler. 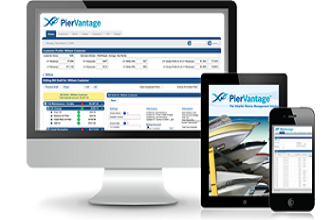 PierVantage™ is the marine industry’s first and only integrated, cloud-based business management solution specifically designed to help boatyards, boat builders and marinas operate more efficiently, increase revenues and cash flow, reduce costs and overhead, and increase customer satisfaction. For more information on how PierVantageTM can help your business, please visit www.piervantage.com or contact Stephen Bullard at sbullard@corvant.com.